Just what is going on in your bathroom??? Not that, the feng shui?It is a tough question unless you are in the know. Lucky for you, I am. It's a common question, people are really concerned over the energy of their bathroom in more ways than you might expect. Are you heeding the admonition of the great keep the toilet lid down, and the bathroom door closed? Do you have red ribbons around drains and pipes? Are you afraid of flushing your wealth down the toilet? The easiest way not to flush your money down the toilet is to keep it out of the toilet. Wanna double it? Fold it over and put it back in your wallet!!! Seriously. there are so called feng shui experts and masters out there that have some people in a major tizzy over the indoor plumbing issue, like the previous method was better!?! I have seen and heard it all, red around pipes, drains, mirrors on the ceiling over drains, boulders in the bathroom, even curtains secluding the toilet so little or no chi would escape. All of these are very interesting but have absolutely nothing to do with actual feng shui in the traditional sense. What Is The Real Deal??? 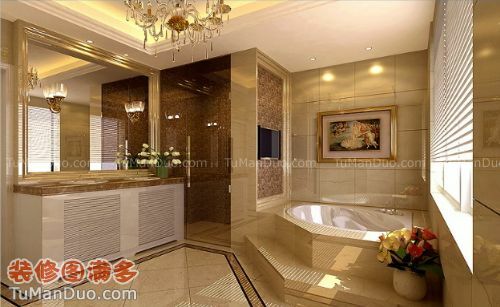 The truth is that your bathroom has its own specific feng shui energy just like any other room would have. It cannot be classified as positive or negative until is has been evaluated, calculated and interpreted by a qualified practitioner. And even if it is bad- it can not be flushed down the toilet so many times into non-existence. The flying stars of the area would be evaluated, but it has nothing to do with the function of the room determining energies presence. We tend to spend less than an hour a day in our bathrooms so it is rather unlikely that the chi of your bathroom will have a great impact on you, good or bad. You can safely relax that there is nothing to fear about having indoor plumbing, I rather enjoy it and wouldn't want to be with out it. Typically the more prosperous a person is the more bathrooms they usually have!!! You are not losing anything you aren't already trying to get rid of anyway. So relax and enjoy the indoor plumbing, make your bathroom into a blissful, relaxing spa-like atmosphere, or whatever environment you desire. As always the first rule in feng shui is to make your home your sanctuary. You spend a great deal of your life in your house and it should be a welcoming comforting experience. This goes for your bathroom too!! !